Corner fireplace ideas – Fireplaces are not common things to see in countries with only two seasons. But their existences mean so much to people in four-season countries, especially when winter comes. That’s why most people needs corner fireplace ideas to modify their fireplace from time to time. In the past era, fireplaces were used not only to warm people up during cold days, but also to cook, heat up water, and even dry wet clothes. Their significant benefits were the reason why people need exactly one at their house. Nevertheless, due to the advancement in modern technology nowadays, people change their reason of having fireplace at home. Rather than to heat the house dwellers up during winter, fireplace is more of a home décor and therefore, people have it designed in the best way. Usually placed in the living room which none other than the center of the house makes the fireplace area becomes an important point for family members to gather around and have a comfortable conversation or just enjoy each other’s company to relieve their day’s fatigue. Moreover, the warm it gives to its surrounding, create the purpose of relaxation and ambiance. Because of that, for it not to be a boring space for family members to gather around, the design of a fireplace must be thought thoroughly. This is not the era when stones and blocks are what build fireplaces. The more you play with marbles and glass in building fireplaces, the closer you are to modernity. Today’s article will discuss about corner fireplace ideas and its application in some types of house. Several of which will include the advantages and disadvantages of having certain model of corner fireplace. If you are in the middle of having a new or remodeling your old corner fireplace and looking for references, keep on reading this article and you will most likely find out one to your liking. Long story short, Art Deco is a decorative architecture and arts movement which started in 1920s and developed in the United Stated and Western Europe into a major style during the 1930s. To have Art Deco influence in designing your fireplace means to give it the right style of making use the outstanding decors and find the right location to install it. Like the one in the picture. Take a glance of it and you see that it looks quite modern but has no difference with the past designs. 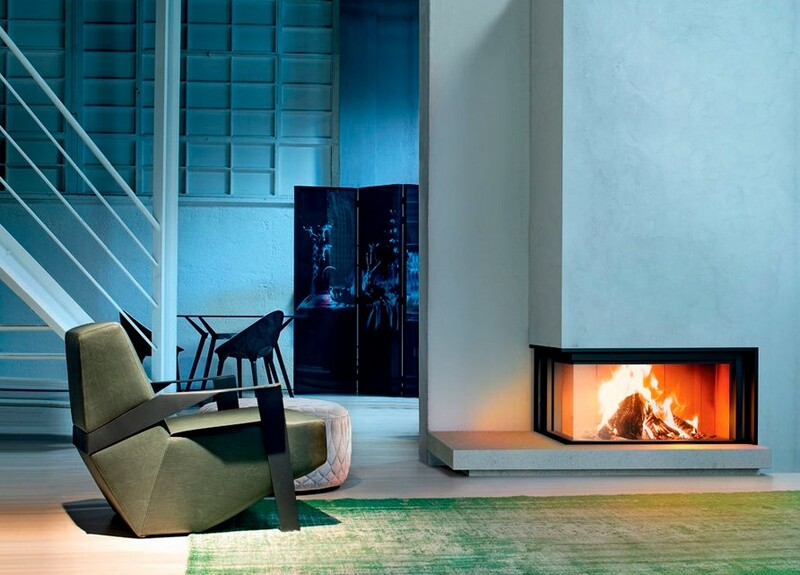 The materials used to build this fireplace are the ones what give the statement of modernity. If you have small space, then this corner fireplace ideas is ideal for you. Since it needs less room, it provides different range of budgets, too. However, less room also means style limitation where you can’t make much improvisation. 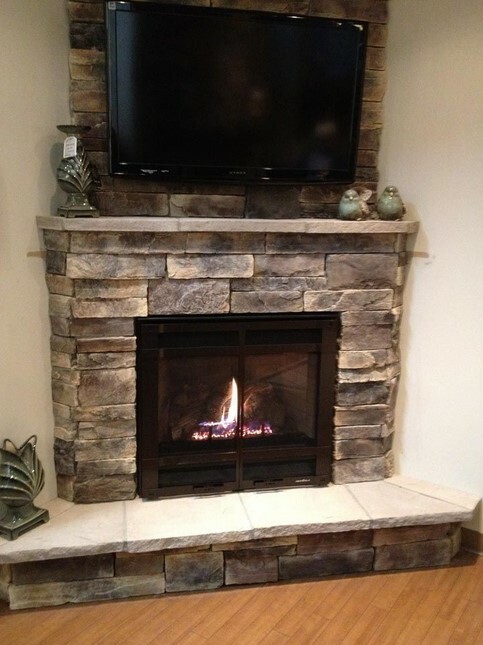 Stones are durable and therefore are great materials to build a long term fireplace. 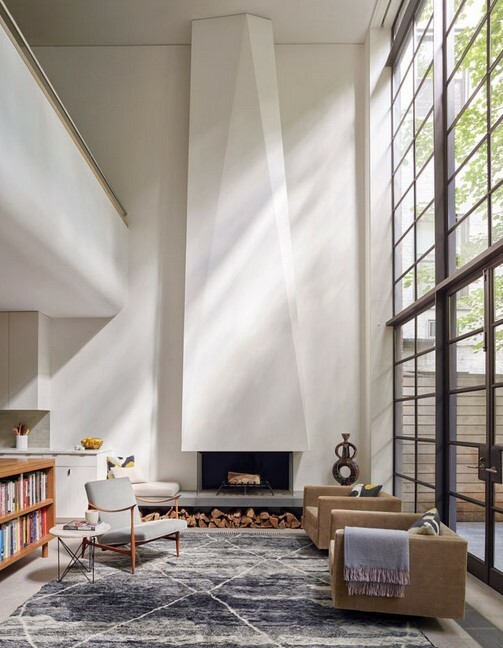 Though it is said that stones are mostly seen to be of what built the old fireplaces, but have it installed in modern living room, like the ones in the pictures, is quite awesome. Stones give a unique design to the whole room and decoration. With light stone materials selection, the installment is some kind of piece of cake. You can also clean it with no hard work. However, like any other materials, stones also have disadvantages. They are easy to crack. Once it happens, you need to replace the whole piece. Not to mention the high budget you have to prepare, because stones are quite expensive. The design and materials used in building a fireplace are what stating whether some fireplace is modern or not. From the pictures, you see the modern fireplaces can have both closed and opened design. The purpose of closed fireplace design is to make sure you don’t have to worry about the smoke, because it will directly go to the chimney without a chance to spread itself to the whole room. Though closed, you can still feel the heat it gives through some contemporary mechanism. Here is a bonus tip if you want to have a closed fireplace: build it rather raised to give some space for extra seating under the fireplace. It will be perfect to enjoy the relax sensation fireplace gives from the closest distance after a hectic day. Meanwhile, there are also opened modern fireplaces. The past models were mostly opened, too, but with a single glance we surely can tell the difference between the old fireplaces and modern ones from the clean feel they give to the room. 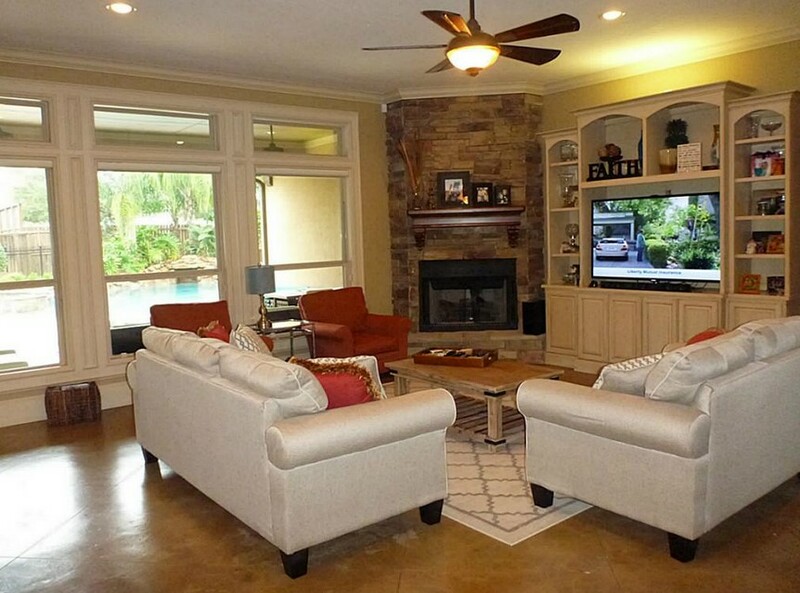 A good idea to more enjoy the warm atmosphere in fireplace area is to put a TV. The two pictures give you examples. 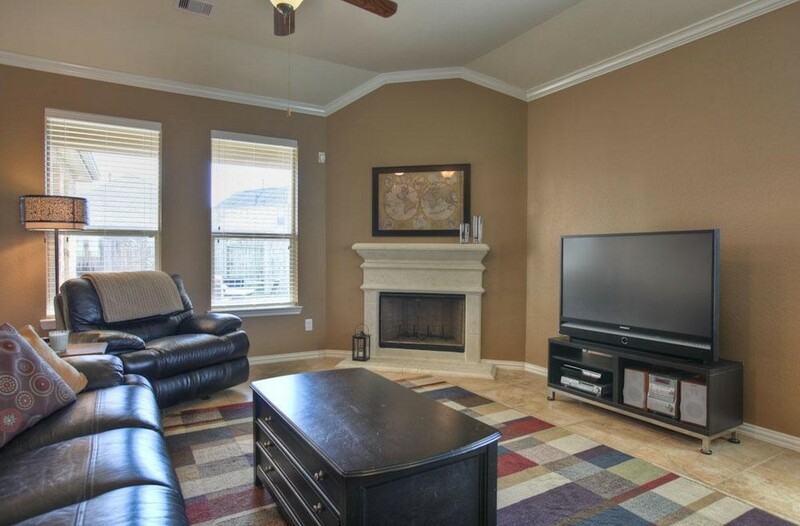 First picture says: a fireplace in the corner with a mantel and a TV at the center is a perfect combination. What gives more statement to the room is the placement of a painting above the mantel. You can hang the painting and leave a little space between the painting and the mantel, or you can use the mantel as painting shelf. Both ways affect similarly good. 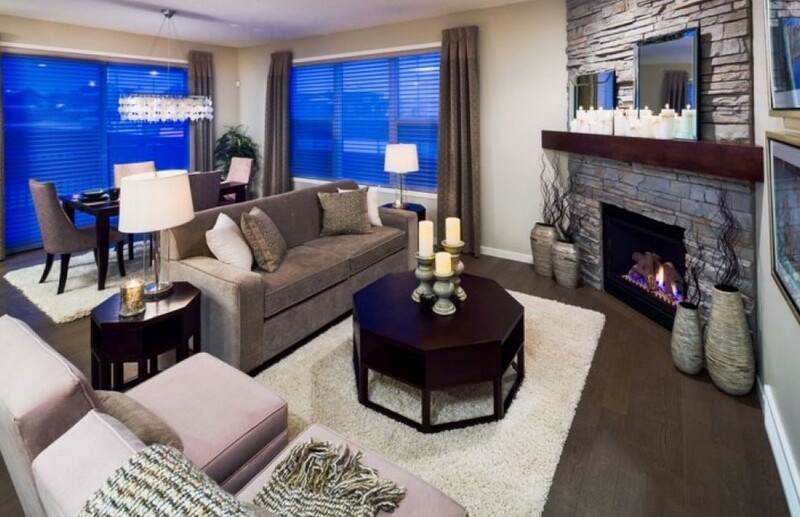 While second picture suggests the use of electric fireplace and TV stand which is helpful in saving space. Put it in the corner and you’re able to save much more. The picture shows a nice room with a medium sized wood burning type of fireplace. A mantel is placed above the fireplace with some ornaments on top. The room is beautifully designed with cream ceramic tiles flooring. To have a wood burning fireplace, you have to purposefully showcase the logs supplies. The set of the fireplace and its logs supplies has to be the focal point that attracts people who come to your house. Sometimes, your focus of having a fireplace at home is not on the design or the materials used to build one. It is rather on the mantel. Choose the one that suits best with your fireplace and the whole room decoration, and it can give the best statement. 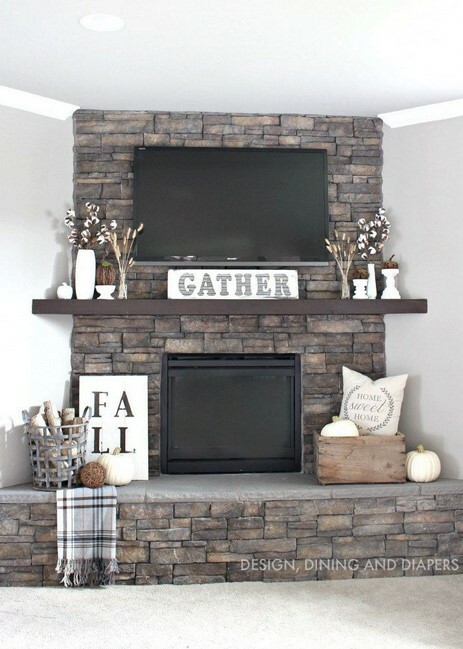 For example, rustic mantel goes absolutely well with corner stone fireplace like the one in the picture. The mantel lets you to decorate the room with some ornaments that are so you. 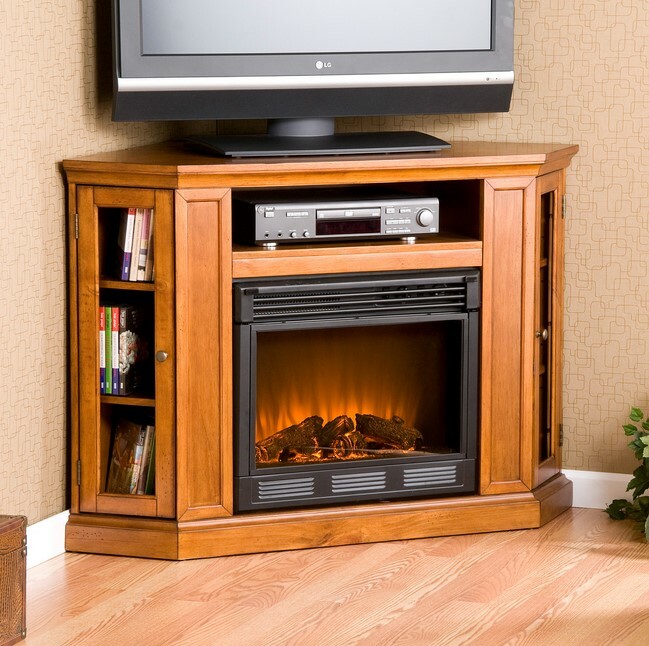 As mentioned earlier, an electric fireplace helps you in saving space. It goes really good as a combination set along with TV. Be it placed inside a TV stand or has its own setting like the one in the picture. An electric fireplace often comes with glass closure. Therefore you will mostly likely need to clean it at least once a year. Here’s a tip to get the best result in cleaning the glass: use a combination of water and vinegar or a special cleaning solution for fireplaces. Try to avoid ammonia containing cleaners if possible. Don’t worry about your corner wasted space in the living room anymore, because here is an idea to make use of it: build a fireplace. A fireplace between two walls like shown in the picture is one of some great corner fireplace ideas. Besides making use of some wasted space, this kind of fireplace can be the part of room decoration. The only disadvantage it has is it will be bothersome in time you want to have the room redecorated. Therefore, if you are the type of easily bored person, don’t try this idea in your house. Playing with color is also a good idea to decorate your corner fireplace. 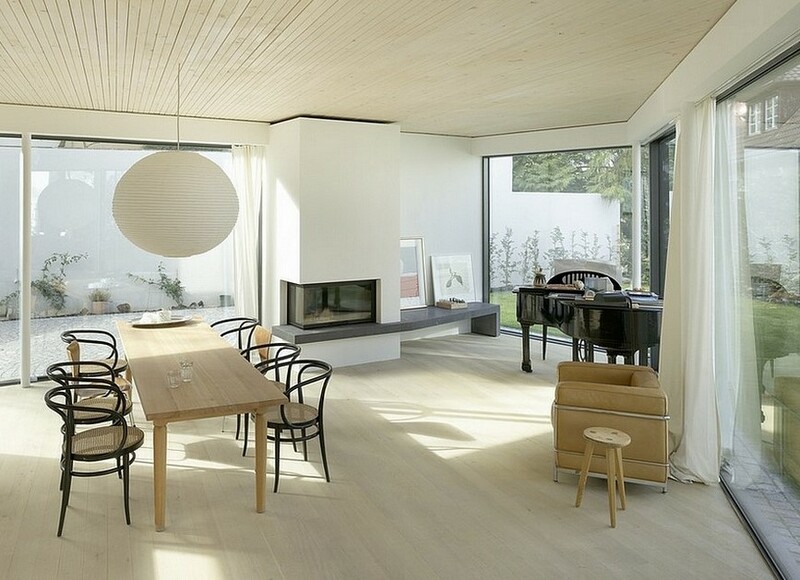 Choose white and you will have an impeccable fireplace finishing as it is unique and elegant. 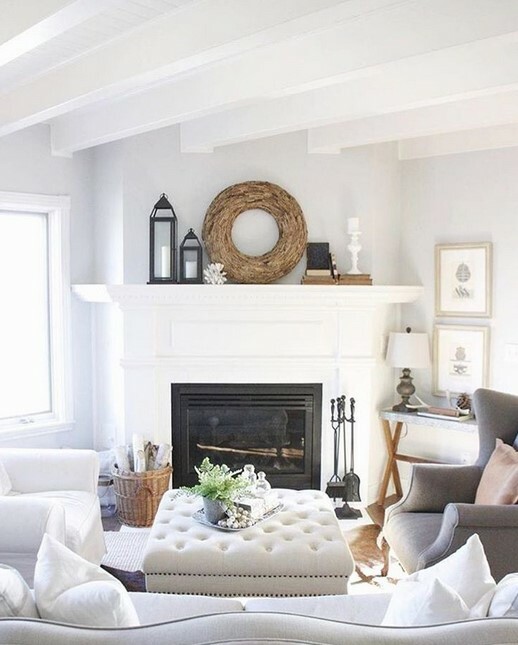 White corner fireplaces, like seen in the picture, are often come in electric type, or you can build one yourself with any materials you like best and paint it in white. 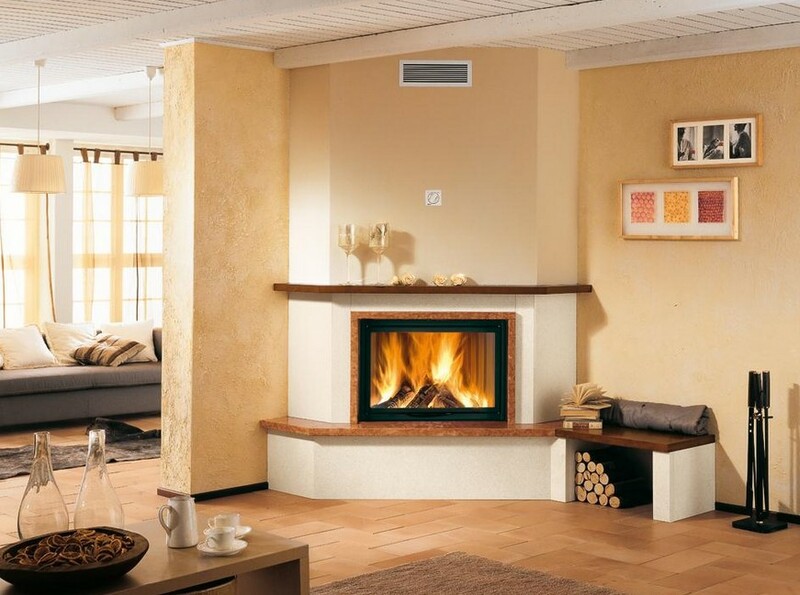 Here are the advantages and disadvantages of white electric corner fireplace. A good material selection leads to the best result. 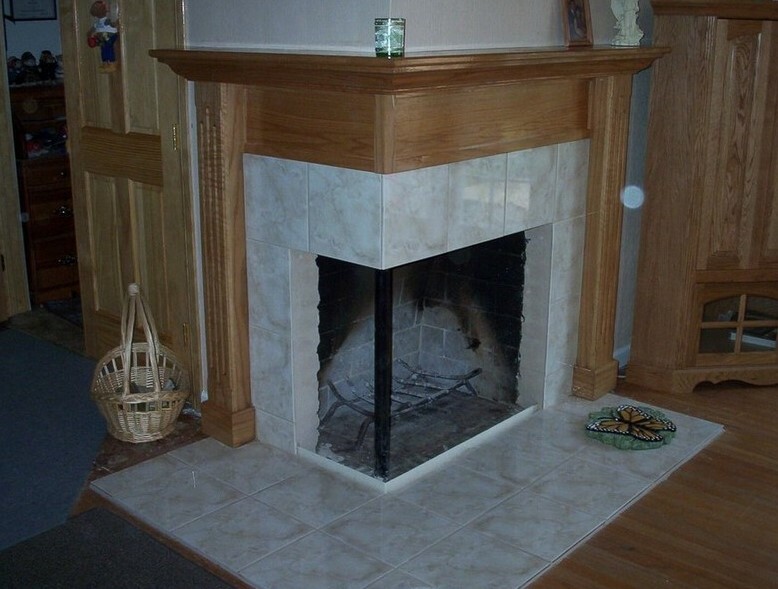 A white corner fireplace is often made of stone, brick, and wood. Select the most popular material like wood, as it is easy to install and maintain. Wood is also light and very durable. These fireplaces have more space than regular ones, so they’re not for small houses. Because they have more space, they tend to make the room look smaller. Corner fireplace ideas and inspirations mostly come from the living room. But nowadays, there are a lot of amazing bedroom fireplace designs as well, corner ones on top of that. While placing a bed at the center of the bedroom is very appealing, give your corner space to a brilliant and stunning fireplace. The picture gives one of the ideas. Place a comfortable three seater in front of the fireplace, so you can warm up your body during cold nights before sleeping. The placement of some decorations on top of the mantel also makes a statement. An additional single sofa with a companion of reading lamp around the fireplace area also gives a point to you, bookworms. You can read comfortably with that. Lovely! What is in your mind if you hear a ‘dream bathroom’? Well, we daresay that the picture pretty much speaks the description, doesn’t it? It has the view of an ocean, a sunken tub, and its very own fireplace. This dream bathroom belongs to a house in Dana Point, California, which decorated by Ohara Davies-Gaetano. Further explained, instead of a big white tub made from porcelain, she rather chose to design a sunken bath made from marble. She did so because of the magnificent view seen through the arched window. The sunken bath makes the room feel more open as it practically disappears from people’s point of view. It definitely is one of the greatest bathroom corner fireplace ideas. There are a lot of smart ways to put your kitchen corner space into use. Some of which are to put a classic corner sink, a space-conscious corner range and hood, sleek floating shelves, an exclusive pantry, a beautiful banquette, and a small dining space. But who would have had an idea to put a corner fireplace in the kitchen? Besides living room, bedroom, and bathroom, kitchen can have one of those scorching things, too. A fireplace in the kitchen of course has its own unique appeal. It surely makes a dreamy addition. But, another sure thing is, mostly kitchens don’t have much space to spare, with the stove, dining table, refrigerator, sink, pantry, and so much more that need some space. Therefore, to put a corner fireplace in that kind of packed kitchen definitely won’t work. 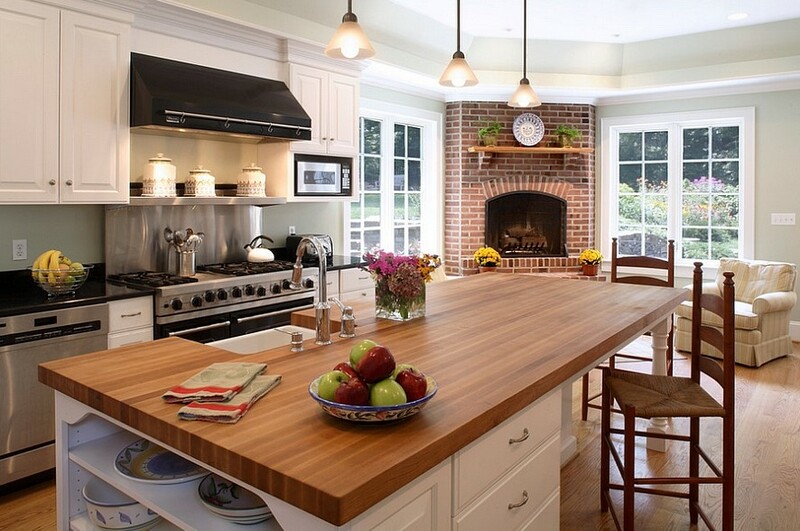 This idea will only work in large traditional and farmhouse kitchen like the picture shows. After so much hard work of preparing a proper meal to your family members during cold days, relaxing your body in front of the fireplace is pretty much an enjoyable gift. You can make use some wasted corner space in your dining room by placing some chairs and a small coffee table to make a family area, making a simple reading nook, putting storage and display, and also placing a cozy fireplace. You can make it happen with a classic fireplace along with a mantel. It will be more than cozy. 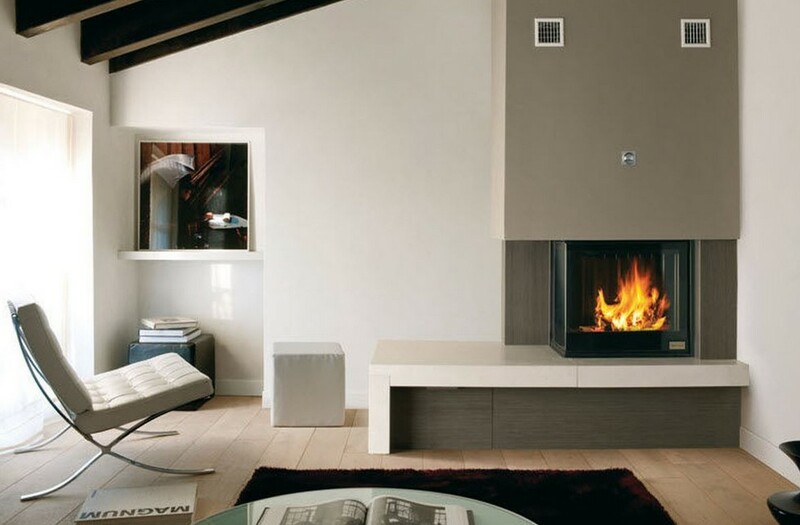 Or, if you can’t afford it, try with a sleek and modern fireplace like the one in the picture. A corner fireplace ideas made from brick gives a homes and sophisticated touch to a room with the right design, a matched mantel with the room’s style, and a little bit of decoration. It will be a wonderful focal point in any space you have. 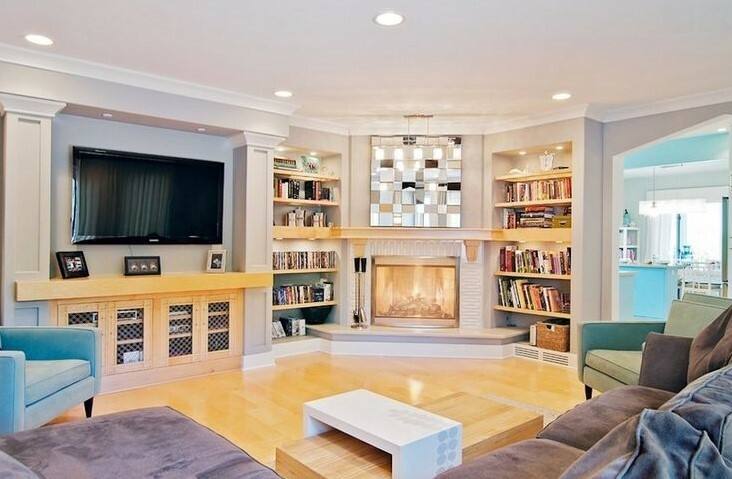 To a contemporary living room like shown in the picture, an old style of brick corner fireplace is what goes well. 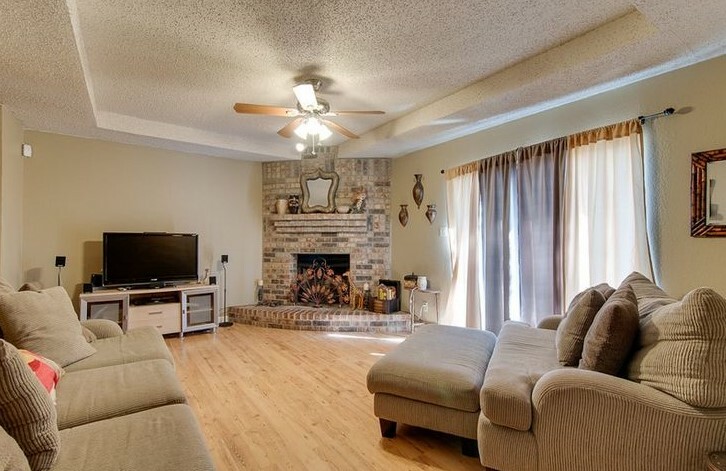 With the right placement of seating and TV, your living room will be adorable. One of the advantages of having a brick corner fireplace is you can paint it whenever you feel bored of its look. They say even the most amateur DIY-ers can learn how to paint a brick fireplace by themselves if they know the steps and what they need. Here are some other advantages and disadvantages of brick fireplaces. The materials and installation are less expensive. Easy to repair or replace single bricks. So there’s this type of corner fireplace when two rooms can feel the charm ambience, and warmth at once from only one fireplace. The picture gives you the answer. Yes, it’s none other than two-sided corner fireplace. From the picture you can see that the mantel is also two-sided following the fireplace design. It gives you more space to hold some ornaments. Provides a nice view in two separate rooms. Not good for heating the house. After reading the whole corner fireplace ideas article, it comes to our realization that apparently corner fireplaces have a lot of designs. It can be made from many materials, and are able to install not only in the living room, but also in the bedroom, bathroom, kitchen, and dining room as well. Hopefully, you can find this article useful. These corner fireplace ideas might guide you for a reference to have a new design or remodel your old corner fireplace. « 37+ Tiny House Bathroom Designs That Will Inspire You, Best Ideas !